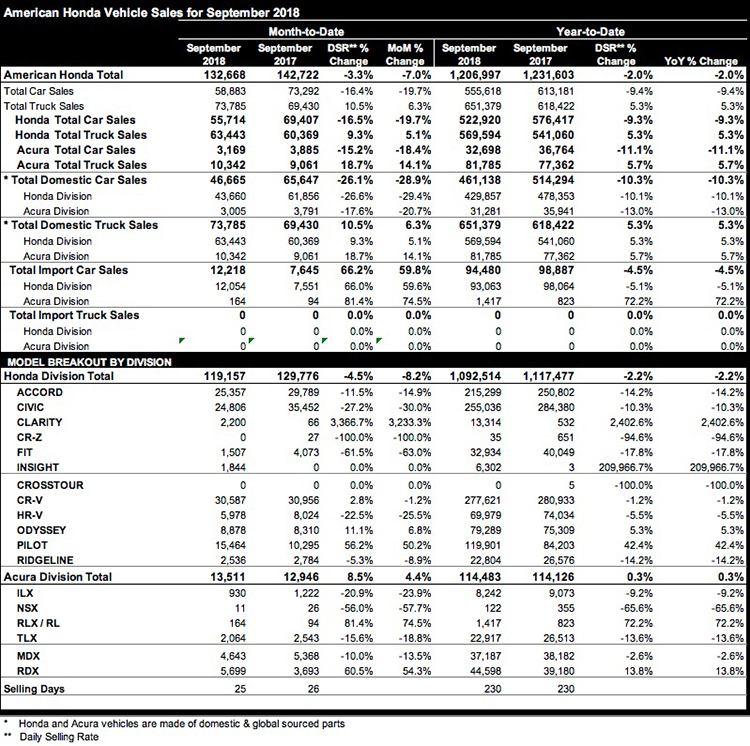 ""We enter the final quarter of the year in a very strong position across our passenger car and light-truck lineups, putting us in striking distance of a fourth consecutive year of record sales for the Honda and Acura brands combined," said Henio Arcangeli Jr., senior vice president of the American Honda Automobile Division. Honda is the only brand in America to earn an IIHS TOP SAFETY PICK across car, SUV, minivan and pickup models, including the 2019 Insight. Acura's flagship luxury SUV, the MDX, turned in another strong performance with sales of 4,643 units in September. Acura's revolutionary True Touchpad™ Interface is a hit with RDX customers and won praise from the editors at Ward's, who said it's "everything you could want in a user experience." This revamped Acura portfolio can’t come soon enough.